Jamaica Stock Exchange > News > General > Opportunity Closing for Submission … Act Speedily! Opportunity Closing for Submission … Act Speedily! 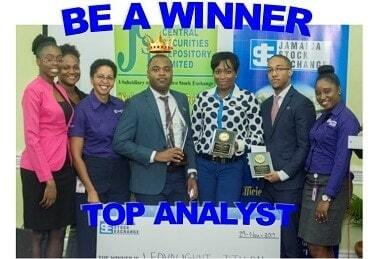 The window of opportunity will close shortly for candidates to submit their market research for assessment by the Jamaica Stock Exchange (JSE) Market Research Committee and benefit from the recognition and rewards that follow. October 30, 2018 is the deadline for submission for the 1st Quarter leg of the 2018-2019 Market Research Competition. Professionals as well as students in the financial services sector: employees of stockbrokerages, financial institutions and the media; students enrolled in tertiary institutions and other stakeholders with the aptitude and interest are being invited to enter the JSE’s Market Research Competition for 2018 – 2019. *Candidates are required to indicate their interest by completing & submitting the interactive Entry Form below.